I’m excited to introduce our August Bride of the Month Nicole Abate-Kenyon. We loved her save the date that gave her guest the reminder of what to look forward to and how her “modern chevron” invitation really set the tone for the type of wedding she would be having. Nicole’s amazing photographer OpieFoto captured her beautiful wedding held at the prestige Stein Eriksen Lodge at Deer Valley. It just shows having talented vendors really does make all the difference for an occasion such as Nicole’s! Bekka: How is married life and do you feel any different? Nicole: Married life is GREAT! Alex and I have been together for a while now, so not much changed after the nuptials. Getting to call him my husband is one of the best feelings in the world. Bekka: Where did you get your inspiration from in designing your invitations and did you know exactly what you wanted or did you have a bunch of ideas. 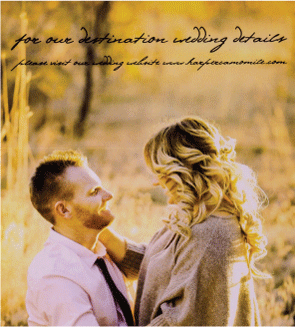 Nicole: My inspiration came from an ad I saw in Utah Bride Magazine. It was a picture of a wedding party dressed in preppy navy blue and Kelly green. I knew right then that those were my wedding colors. Alex and I originally come from Connecticut, and now currently live in Denver, so we wanted to incorporate some east coast prep into our invitations for our mountain wedding. Bekka: What is your favorite part of your invitations? Nicole: Our Save the Dates were so fun to design. I loved that we were able to incorporate places from our past, present and future, as well as show the guests where they will be joining us for our special day. Ann Elizabeth was able to incorporate a modern chevron into a simple and elegant design for our invitations, which made them really unique and special. The blue and green stripes and chevron have to be my favorite! 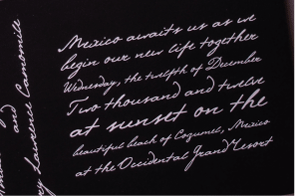 I also love the font I chose, because I feel it set a casual tone for the wedding. Bekka: Was there any feature of your invitations that people complimented you on most? Nicole: I got so many compliments on the originality of the invitations. From the map on the Save the Date, to the simplistic, yet modern design on the invitation, people really got a sense of what the wedding atmosphere was going to be like. Bekka: Some brides take the theme of their invitation and tie it into their wedding decor did you use anything from your invitation? Nicole: Yes! Our wedding colors were Navy Blue, Kelly Green and Grey so all of the décor was in line with this color scheme. The bridesmaids wore neutral grey dresses which allowed the mountains to really shine, and not be overpowered. The Groom and Groomsmen wore navy blue Vans and green striped socks to dress down their suits. We also had some chevron mixed in with paper straws and place cards. One thing I have always been picky about is matching the Save the Date to the Invitation, and then trying to incorporate that into the design of the wedding. I think it all went together very well! Bekka: Do you feel that your invitations set the tone for your wedding? Nicole: Absolutely. We wanted a casual mountain feel in an elegant setting. I feel that the invitations set the casual tone for the wedding, for sure. I definitely was looking for an invitation that was not too fancy, but pretty, fun and reflected us as a couple. Nicole: Look at lots of magazines, check out the Ann Elizabeth website, and of course…Pinterest! There are so many great ideas online. You just have to figure out what message you want to send to guests, and as long as you can communicate that to Ann Elizabeth, you are no doubt going to get exactly what you are envisioning. Bekka: How would you describe your wedding day and was there anything that happened that you didn’t expect good or bad? Nicole: Our wedding day was definitely the best day of my life. It was relaxed, fun and full of love! I started off the day with yoga on the deck with my bridesmaids at Stein Eriksen lodge and the Boys hiked Deer Valley. This set the tone for the day. After that came the routine “getting ready” and pictures before the ceremony. The ceremony was short, sweet and beautiful and the reception was a blast. We wanted all of our guests to have a great time and I really feel that they did! I would say the one thing I didn’t expect, was that I was so calm. I expected to be anxious and crying at every little thing, but it was actually one of the most serene and memorable days of my life! Bekka: Tell us a little more about the vendors you chose and how it made your day that more special! Nicole: Well first off, I have to give a shout out to our photographer, OpieFoto. Opie was a pleasure to work with. She takes amazing photos and is such a creative artist. I can’t stop looking at my wedding photos or my album! As for the venue, Stein Eriksen Lodge holds a special place in my heart, because we have spent a lot of time there during the winter ski season. This just felt like the perfect location for us to tie the knot. The other vendor that really made our wedding special was Couth Booth. They provided our photo booth and we have so many awesome, hilarious pictures from them! Bekka: Nicole you were so great to work with, thank you for sharing your beautiful wedding with us! If you're planning a destination wedding here are some do’s and don’ts to help you prepare. Traditionally a destination wedding is focused on a smaller group of close family and friends therefore sending a save the date is a MUST! Especially if you are planning to wed over a holiday where guest will need to plan accordingly. Etiquette time frames for sending out your save the date on a destination wedding should be six months to a year depending on location. When planning make sure you have the date, venue and URL locked in before sending them out. This gives your guest an idea of what to start planning for as far as travel goes. When creating your save the date card you can use elements of design from your wedding theme which can be carried throughout your invitation suite giving your guest a fun teaser of what's to come. 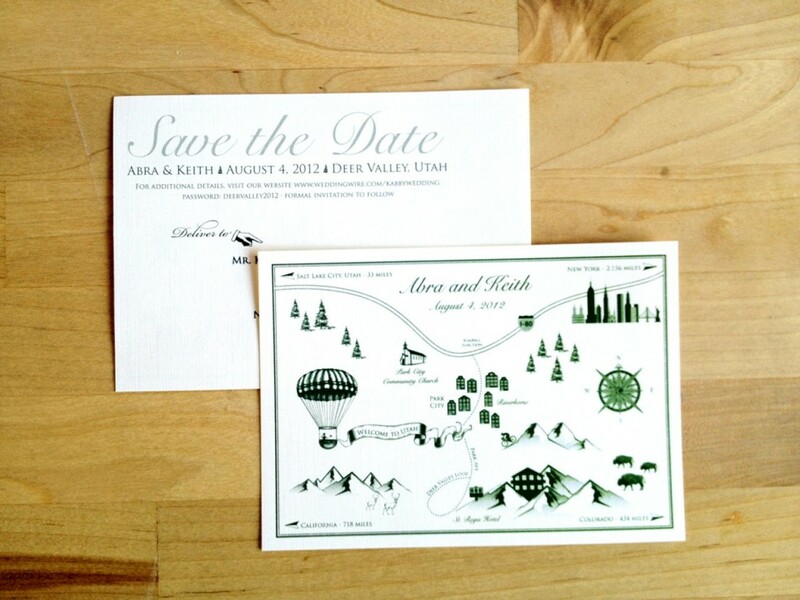 A save the date should have the date, destination, invitation to follow and a URL. Keep it simple by the way of wording and have fun with the design to get guest excited about the big day. Do not give too much detail on a save the date card. For example: ceremony details and activities that will be going on during the occasion. You don't want the save the date to be confused with the invitation. If you have a whole weekend planned you can say “Save the Weekend”. With a weekend full of activities and events you will need an itinerary with details that your guests can take with them so things stay organized. Your itinerary should be incorporated into your invitation and again this is where you can get really creative and use your destination for inspiration. With helpful do’s and don’ts you can create a well organized destination wedding that you and your guest will have memories to enjoy for a lifetime! Including a URL is highly recommended because it directs guests to find details like accommodations, maps and other important travel details at your wedding website, rather than needing to include paragraphs of details on the your save the date. Not sure when to mail your save the date? Most wedding experts recommend mailing save the dates 6-12 months prior to your wedding date. If your engagement is shorter just be sure to send your save the dates a minimum of four months ahead to allow your guests adequate time to make arrangements. Additionally, save the dates aren’t for just weddings - any event where you need to give guests advanced notice is a good opportunity to use a save the date. Consider a save the date for Bar/Bat Mitzvahs, Quinceaneras, Company Parties, New Year’s Eve Celebrations, Birthdays and any other gathering where lots of planning will go into the event and giving your guests advanced notice will be of benefit. Congratulations to Brittany Scalabrin-McNamee, January's Bride of the Month! This month we are excited to share Brittany’s invitations with you! Brittany came into Ann Elizabeth with a fairly detailed idea of what type of message and feeling she wanted her invitations to convey. As we met with Brittany she conveyed to use that she was after a style that was classy and elegant with an outdoorsy feel. Brittany knew she wanted to have a copper as one of her colors for the invitation because of the history of the copper mines in Butte, Montana near the location of their wedding. We paired the copper with a navy blue and toned it down to give it both a masculine and feminine element. Our invitation consultant Ruth Sorenson sat down with Brittany to get her take on the invitation process. Below are some of the highlights from Brittany’s recent interview. Ruth: Is there anything about the proofing process that helped you to visualize your invitation and how it would ultimately come together? Brittany: Definitely! All the options I was given at the beginning helped a lot... I liked being able to say I like this one, not that one and seeing the additional ideas you came up with it made it super easy to figure out what I wanted. Then we were able to go back to the design that I liked the best and make some minor tweaks. It just made it so easy. Ruth: Are there any elements of the invitations you had positive feedback on? Brittany: The whole thing! Everyone absolutely loved the colors and said it was different from anything they had seen before. 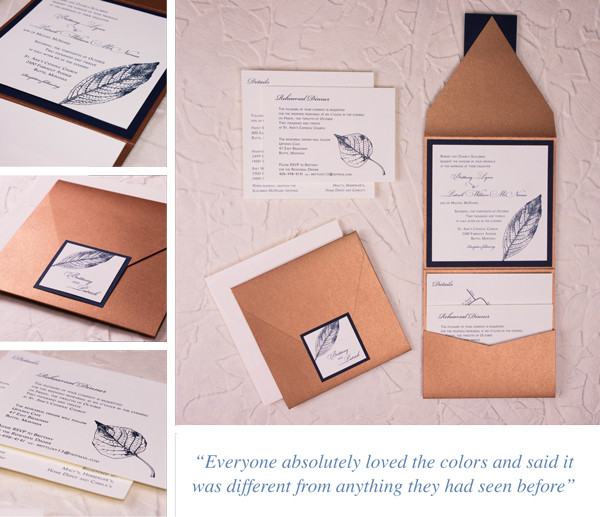 It was unique, I wasn’t just your typical invitations and I love that the color combo was warm and inviting. Ruth: Did you take any elements from the invitation into your wedding? Brittany: Well actually I did the reverse and brought elements from my wedding into my invitations with the help of you guys! Mostly the colors, but also the branches and the leaves from the centerpieces I planned for the wedding - the nature elements all tied in together so well! Detail of Programs and Wine Bottles Ruth: What advice would you give to other brides planning their invitations?Brittany: Most importantly I would say don’t limit yourself. When you find something that you really want it, go for it! That’s what I loved about you guys - you brought together elements I never thought could work and when I would suggest something that might have sounded crazy I never felt like you weren’t willing to try it out and let me see how it might look. My second piece of advise would be to pay Ann Elizabeth to assemble and glue together the invitations. Ha! When I made the decision to do the assembly on my own I thought it would be easier, but by about invitation number 75 I was thinking “this may have been a bad idea!” Ruth: How was your experience with Ann Elizabeth?Brittany: AMAZING! It was fun and you guys just have the best personalities. I was fun to come into the studio and sit and just talk - even about non invitations, but just wedding stuff in general. I always looked forward to coming in because your enthusiasm and how excited you get definitely comes through in your work. That enthusiasm alone reassured me I was getting a quality product that would impress everyone!Thanks for taking time to talk with us Brittany! You were a pleasure to work with! Happy Tuesday! We're not wasting any time today. Let's jump right in! 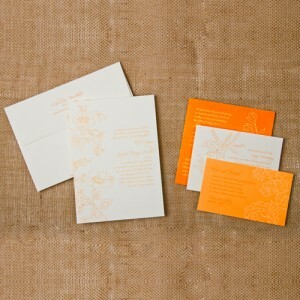 Today's post answers the ever-burning question, "When should I send my save the dates, invitations, thank you's, etc?" My first answer to that question is, "Well, it depends." I realize this probably isn't the answer you wanted to hear, but read on! I say, "It depends," because every wedding is different. Some are formal (think black tie events), some are very laid back and casual (think backyard wedding with barbecue to follow). The coolest part about it is that your wedding can be a reflection of you. The nature of your wedding is really what dictates your wedding correspondence to begin with, along with the timing of sending it out. That being said, I'll give you the guidelines for what etiquette encourages, and then you can custom tailor your own timing around the nature of your event. Here at Ann Elizabeth, we recommend sending your Save the Dates out six months to a year in advance. This recommendation is with your out-of-state guests in mind; you want to give them as much notice as possible so they can plan travel and lodging. If you still have questions, check out my in-depth post about Save the Dates and see if your questions aren't answered there. If not, you're welcome to email me at dana [at] annelizabeth dot com and I'd be happy to help you out. It's best to mail your invitations around 6 weeks prior to your event, which would mean starting your wedding invitations 10-14 weeks before your big day. You may think this is a huge chunk of time, but believe you me: it will FLY by! It's important to make sure you give yourself enough time. Personally, I'd rather have more time than not enough. If you are including an RSVP with your invitation, tack on 2 weeks to the "6 weeks prior" deadline I just mentioned and make it 8 weeks. You'll want to set the "RSVP by..." date a couple weeks prior to your wedding to give yourself some time to get everything organized and your numbers down solid. My Grandma always used to say, "Gratitude is the best attitude." And how right she is! Get those thank you notes into the hands of your beloved guests as soon as you can, but no later than your 2 month anniversary. They'll be happy and so will you. I hope this helps you feel better about the timing of when your wedding correspondence should be sent. Until next time! It is more than common for brides to have questions about Save the Dates. To send or not to send? What information HAS to be included? In today's post, I'll cover the "ins and outs" of Save the Dates, and help you decide if these wedding reminders are a necessity for your wedding or not. Do I need to send Save the Dates? a destination wedding for everyone; you AND your guests will be traveling somewhere for the wedding. If you've got everyone jetting somewhere for your big day, it's best to give them as much time as possible to book their airfare, hotels, etc. a destination wedding for your guests; you live in the area you're "tying the knot," but some or all of your guests will be flying in. Just because it's not a destination for you, doesn't mean it's not for them! Let's say you live in California, and want to get married on the beach you got engaged on. Your big, Italian family from New Jersey is flying in, so it's best to give them time to book travel and lodging. your wedding date is on or over a holiday/ holiday weekend. This is one people tend to over-look. If you're planning on getting married over a national holiday- let's say Independence Day weekend- it's best to give people a "heads-up" so they can make sure they're there for your wedding. Here's a special one: your region's traditions. It may come as a surprise, but the United States has different traditions based on its different regions. The eastern US tends to expect more traditional correspondence, including a Save the Date (which, itself, is comparatively a newer element of wedding correspondence). The western US tends to be more relaxed about expectations for what you send and what you don't. Simply read up on what the majority of your guests would anticipate for your event and be sure to accomodate them. Do my Save the Dates need to match my wedding invitations? Not necessarily. Some brides-to-be panic a little bit over the myth that they need to exactly match their Save the Dates with their invitations; that they'll have to commit to a given theme prematurely, then if they end up wanting to change, it'll be too late. Your Save the Dates definitely don't need to match your invitations, but it is nice to have at least your colors, font(s), or a motif that is consistent throughout. Above all else, it is key that your Save the Dates reflect the tone of your event, whether it's formal, casual, etc. When should I send my Save the Dates? We recommend sending your Save the Dates six months to a year in advance. Have a shorter engagement, but still feel the need to send Save the Dates? The sooner you can send them, the better. Or, consider using a more non-traditional method of getting your wedding date known, like a wedding website. What information do I need to include? List your wedding website if you have one, where information regarding lodging, wedding day information, etc may be found. The way you give this information is completely up to you, but remember that your Save the Date sets the tone for your wedding. We don't recommend having a Save the Date that is really playful and informal when you plan to have a black tie wedding. Who should I send Save the Dates to? It's a common misconception that you only need to send Save the Dates to certain guests- ones who will be traveling a great distance to your wedding. Don't do this. It is best practice to send a Save the Date to anyone you want at your wedding, no matter the distance they'll have to travel. If you send a Save the Date, include everyone you want in attendance at your ceremony and/or reception. Hopefully this post clears up some confusion about Save the Dates. Have you seen a Save the Date that stood out to you for good or bad reasons? We want to hear about it! Leave a comment below. What if I told you that choosing the perfect color palette for your wedding was easy? Some of you might throw your shoe at me for making such a claim-- for many brides, choosing a color palette is one of the hardest parts of wedding planning. But please put the shoe down for a second and hear me out. Today, I'm going to show you a few sanity-saving tools that are just a mouse click away. Whether you're a color lover or what we like to call "color-phobic", you're going to love today's post! Some of you may be surprised to learn that there are some killer websites out there to help you find or create the perfect color scheme for your wedding, and we've chosen three of our favorites to share with you. There's something for everyone... the bride who wants to get those creative juices flowing by making a custom color scheme, or the bride who wants to see color schemes others have created. And... the best part is: they're all FREE! That's something you don't hear much in the wedding planning process, so we're happy to share. It's important to note that Ann Elizabeth isn't affiliated with any of these companies. We simply think they rock and are worth bragging about. Design Seeds is a an awesome resource! It's a website that's in blog format (familiar to almost everyone these days), with oodles of fabulous color palettes to peruse. This is the most basic of the sites we'll cover today, since there's not a tool here for coming up with your own color palette. But- with all the options Design Seeds has here, there's not really a need! One thing we really like about Design Seeds is the option to search for palettes similar to your main color. So if you at least know you want a "dusty rose" as your main color, you can plug that into the search tool and it will pull up palettes that have that color or something similar. 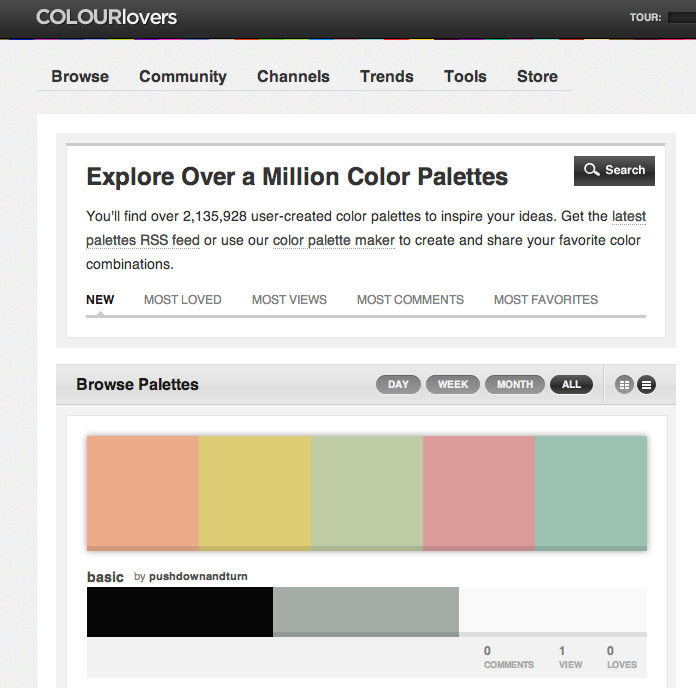 Colour Lovers has so many great options for choosing colors, and is truly user-friendly. You can browse and rate other members' palettes, create your own, upload a photo that has colors you love and it will generate a palette from the photo, and lots more. You'll have to check out the other tools they have available. 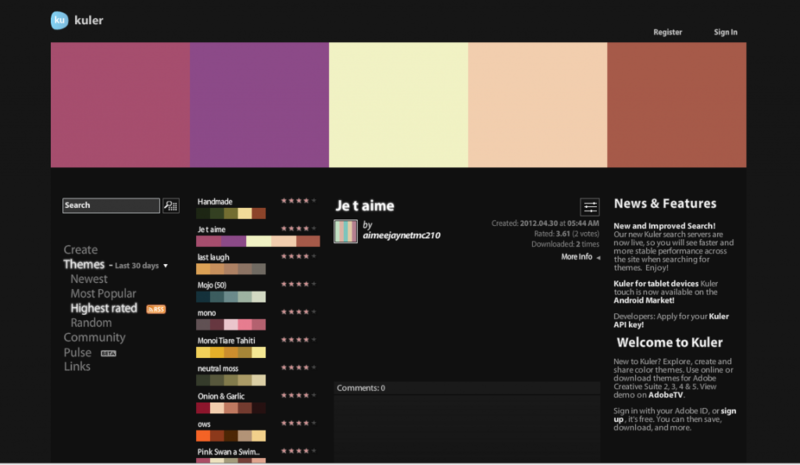 Colour Lovers has tools for the tech-savvy and the not so tech-savvy. So fun! Adobe Kuler (pronounced, "color") is a wonderful resource for color schemes-- a bit more complex than the others, so watch out. Once you register (it's free) you can use their extremely versatile tool for color schemes, upload a photo that Kuler will analyze and extract colors from, browse other members' palettes, and more. This is the most complex in terms of how to use the tools, but once you figure it out, it is golden! So there you have it! Thanks for stopping by. I hope you enjoyed this post today. 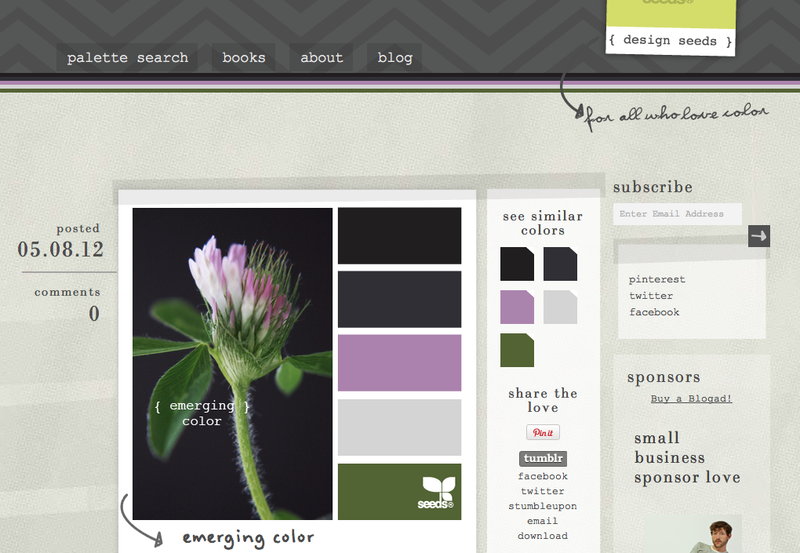 What color palette websites do you know about? Leave a comment- we'd love to hear from you! Have friends who could use this info? Share it with them... pin it, email it, tweet it, post it! We thought we’d share some Ann Elizabeth love… This FABULOUS little beauty is going out today!